A typical HySCO result is visualized for one slice of a baseline image of a diffusion tensor data set. The initial blip-up and blip-down data is distorted oppositely along the anterior-posterior direction. Solving a tailored non-linear image registration model HySCO estimates the field-inhomogeneity. Finally, the data is corrected using a physical distortion model and blip-up and blip-down data are visually almost identical. 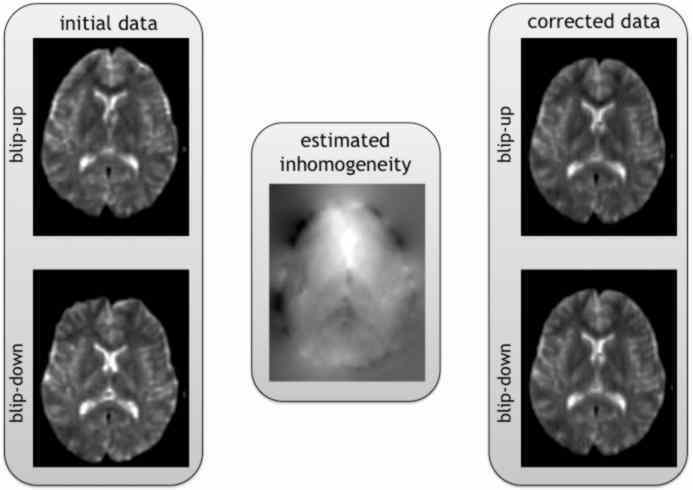 Ruthotto, L, Kugel, H, Olesch, J, Fischer, B, Modersitzki, J, Burger, M, and Wolters, C H.
Diffeomorphic Susceptibility Artefact Correction of Diffusion-Weighted Magnetic Resonance Images. Physics in Medicine and Biology, 57(18), 5715-5731; 2012. Ruthotto, L, Mohammadi, S, Heck, C, Modersitzki, J, and Weiskopf, N.
HySCO - Hyperelastic Susceptibility Artifact Correction of DTI in SPM. Presented at the Bildverarbeitung fuer die Medizin 2013.